4 stars facility, but 1 star service, 2 stars room cleanliness Bad experience. Check-in took me half an hour wait and then told me room is not ready, ask me come back at 2:45pm. I was holding 3 luggages with a young kid and waiting for 30 mins for check in, no bell boy come to help. Room is humid and smelly. There is an aroma to reduce the smell. However, we need to took it out as my son feels sick of aroma. The bed sheet was stinky. I was wondering if the bed sheet been changed before. Based on all of the reviews, I was expecting Katathani to be a top notch hotel with great service and friendly staff. When I first checked in, they gave us 2 rooms that didn't look like the rooms from the pictures I first saw when I first booked this hotel. I went back to the front desk and they claimed to have "upgraded" us to nicer rooms with an ocean view, but that was never stated to us. Also, there were tons of mosquitos in both of the rooms. They switched us back to the rooms we were supposed to be situated with. The bell boys that helped us with our luggage were not so friendly as well. Given that our group just came from Bangkok and Chiang Mai, the staff here was by far the worst. I would never recommend anyone I know to stay at this hotel nor will I be coming back. Hotel staff are so friendly and eager to help you with any of your needs. We had a sea view jr. suite. Perfect for 3 people. Room was well appointed. Shops, restaurants and other facilities were wonderful. Scenery stunning! Beautiful pools. Nail salon, spa, fitness, yoga, outdoor massages so many things. But the amazing people that work there as well as the rest of the places we visited in Thailand are what really made this trip one in a million! The hotel is on the beach. Staff are very good. Rooms can use some updating. The bathroom is very basic more like a 3 star. My room had a horiable smell and the staff tried to fix it only it got worst. Then they switched us to another room. Overall good hotel 4 star not 5 for sure. Primarily caters to guests from China. Resort accommodation and amenities were very good. The recommended improvement is for the hotel staff in particular front desk staff could be improved specially in demeanor and English communication. The logistics are a bit complicated. 1-1.5 hour drive from the airport and if you arrive before 2 pm be prepared to be sitting at the lobby. They definitely won't have your room ready by 2 or 3 pm. Thais are extremely friendly especially towards children; some of the staff seems stressed perhaps overworked at the reception as they are not your typical smiling Thai. The beach is outstanding but the ocean is not easy....quite a bit of under toe and rip currents, so apt for strong swimmers. The hotel could do a better job at hiring people to collect trash along the beach early in the morning. The trash is mostly generated by ships... Restaurants are good, the breakfast has a good variety. The bar and poolside service is very good. Pools in good condition, gym and kids playing rooms are very convenient..
We had a wonderful stay at the Katathani resort. We definitely felt disconnected from the world which was exactly what we wanted. There are good restaurants on site that are convenient and less expensive more authentic options across the street from the resort. We also were able to walk offsite for massages as well. It truly was the best of both worlds (resort living vs local affordability). The staff were great and everything was very clean and well kept. Thank you Katathani for a wonderful vacation! I was looking forward to staying at a beachfront resort while in Phuket. Katathani seemed like the place to go. It has its own beach, and all the amenities. I booked a deluxe room at the Bhuri wing. The room description said that there was a balcony with a pool and sea view. When I arrived at my room, it was fairly small, and the balcony faced into a foot massage parlor and a wall. I called the front desk and let them know this room was not living up to my expectations. They said the only sea views were at the Thani wing. They told me they'd change my room. They took me to another room, still at the Bhuri wing, and the balcony had a view of the pool and sea! Just like I originally expected! Thank you! The room amenities were very basic. My friend was planning on staying there also, but they told him that the entire resort was booked up. That was odd, I had just booked online 20 minutes before we got there. They said the Thani wing had rooms left, but he was quoted 5 x the price I saw online. That was kind of a bummer, it broke up our visit. The resort is big. I was looking forward to a fitness room and game room, but they were on the complete other side of the resort and I never got over there. I did get to enjoy the pool closest my room. It was open until 8 pm. The wifi was very spotty, did not work inside the room, it was best near the pool. The beach is nice. You can parasail or rent jet skis. I snorkeled a little bit, didn't see much, but was enjoyable. Unfortunately, I only stayed at the resort one night. I think that if I would've stayed longer, I may have had a better experience. Overall, I was underwhelmed and somewhat disappointed with my stay here. 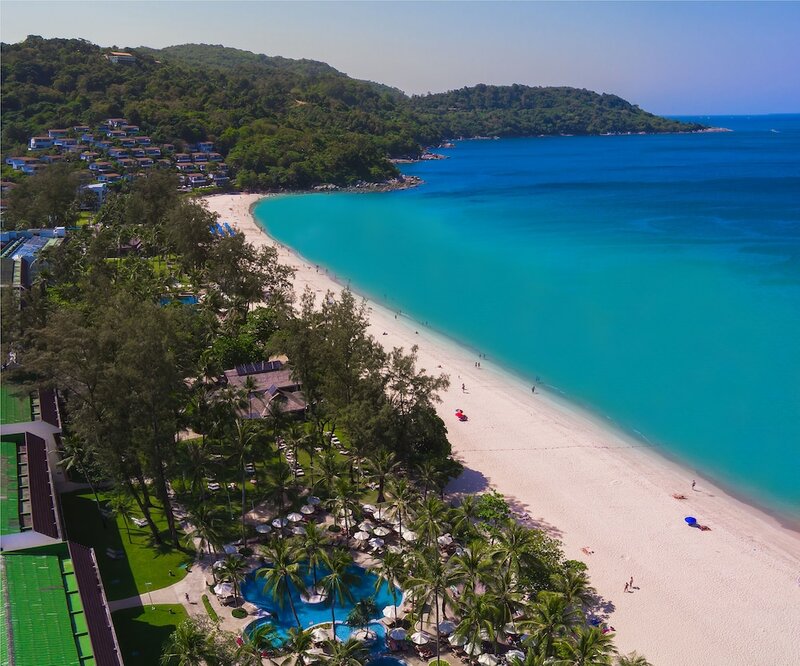 Katathani Phuket Beach Resort places you next to Kata Noi Beach and a short stroll from other popular sights like Kata Beach. This 518-room, 5-star hotel welcomes business and leisure travelers with 6 outdoor pools, a full-service spa, and 6 restaurants. Free buffet breakfast is served each morning from 6 AM to 10:30 AM. There are ample dining options with 6 onsite restaurants, including Chom Talay, which specializes in Thai cuisine. Savor a meal from the privacy of your room with 24-hour room service, or get a pick-me-up at the coffee shop/café. Guests can expect to find free wired Internet and 32-inch an LCD TV with satellite channels and a DVD player. The bathroom offers hair dryers, free toiletries, bathrobes, and slippers. Other standard amenities include a balcony, a refrigerator, and a coffee maker. Guests of Katathani Phuket Beach Resort have access to a full-service spa, 6 outdoor pools, and a children's pool. You can take advantage of free parking, along with a free airport shuttle (available 24 hours). The front desk has multilingual staff on hand 24/7 to help with dry cleaning/laundry, luggage storage, and securing valuables. Other amenities at this beach hotel include a fitness center, 3 spa tubs, and a sauna. Free buffet breakfast is served daily from 6 AM to 10:30 AM. Chom Talay - Ocean-view restaurant and bar specializing in Thai cuisine. Open for breakfast and dinner. Kid's menu available. Fisherman Wharf - Beachfront restaurant and bar specializing in seafood. Open for brunch, lunch, and dinner. La Scala - Fine-dining restaurant specializing in Italian cuisine and serving dinner. Chanadda - Pool-view restaurant specializing in Thai cuisine and serving dinner. Seacret - Restaurant specializing in international cuisine. Open daily for lunch and dinner. The hotel has 6 outdoor swimming pools and 3 spa tubs. There's a children's pool, and other recreation options include outdoor tennis courts, a waterslide, a sauna, and a fitness center. The preferred airport is Phuket (HKT-Phuket Intl. ): 44-min drive, 29 mi/46.6 km. The front desk is open 24 hours a day. For convenient arrivals and departures, you can take advantage of the free airport shuttle (available 24 hours). Driving? This property offers free parking. This hotel provides transfers from the airport. To make arrangements, contact the property with arrival details 72 hours prior to arrival, using the phone number on your booking confirmation.